Blend the majestic Pacific Ocean with the wild beauty of one of Central America's best preserved nature parks, add luxury and elegance; then garnish with Dos Mundos Pacific Resort's innovative approach to the hotel business and you have a recipe for truly unforgettable experience. Located on the most exclusive stretch of Monterrico's beach, Dos Mundos Pacific Resort is a complex of cabañas interspaced in a beatiful garden. 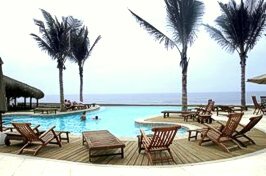 The hotel is constructed in a style tipical of homes built in coastal reagion of Guatemala. We offer 14 beautiful bungalows. Taxes and breakfast (chapín, continental or tropical) are included. The rooms are designed to make your stay at Dos Mundos Pacific Resort a pleasure. We offer king, queen and twin beds. All our rooms are air conditioned and there are hammocks on the porch. Please visit our sister hotel in Panajachel near Lake Atitlan: Hotel Dos Mundos. In filling out and sending this email you are not committing yourself to anything. Once all arrangements have been made you will be asked to pay a confirmation fee (normally 10%) that will be credited to you against the total value of your reservation. This non-refundable fee is required to confirm your reservation. To be clear, only once the confirmation fee has been paid are you, Dos Mundos Pacific Resort or the Tropical Travel Association committed to anything. Dos Mundos Pacific Resort may have additional requirements and/or payments to hold your reservation up to and including full prepayment. Dos Mundos Pacific Resort must clarify these additional requirements (if any) before you are asked to pay the confirmation fee. Unless Dos Mundos Pacific Resort stipulates otherwise, after paying the confirmation fee you are free to cancel for any reason and without penalty up to three days prior to schedule arrival. Any later cancellation or a no-show will cause a billing of one night's lodging per the terms of your confirmed reservation. 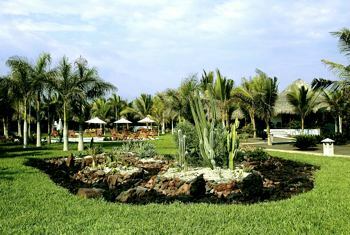 Dos Mundos Pacific Resort · Monterrico, Guatemala · Hotels · Guatemala's best Beach!